Just a quick post to ask if anyone can identify an insect I saw today on this pretty plant I bought yesterday at a garden centre. It’s a Pericallis x hybrida, sold under the trade name of Senetti. 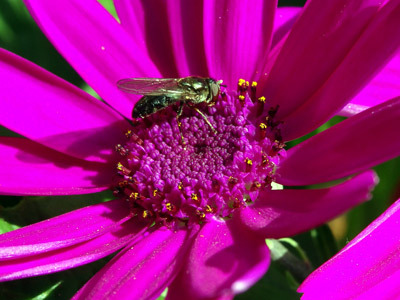 The Pericallis is a member of the Aster (daisy) family and I love the bright colours. Just a quick post to put on record two observations yesterday. This moth flew into the kitchen last night, attracted by the light, and I managed to catch it in a glass. I was in the middle of eating, so couldn’t spend too long taking pictures before I let it go again outside. It was a lovely delicate pink and brown but refused to stay still for long. I think I have now identified it as Phlogophora meticulosa or “angle shades”. These moths have such wonderful common names! Find out more on the UK moths or Butterfly Conservation websites. 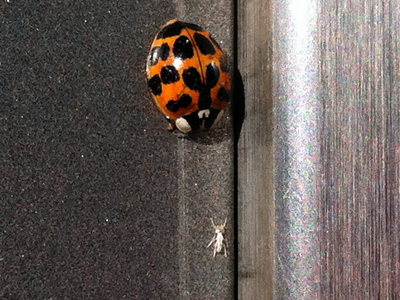 Earlier in the day I saw this ladybird (ladybug) at the bus stop and took a picture with my phone. I saw some more of the insects nearby on a lime-tree leaf. I guess it’s time for the annual harlequin ladybird invasion. The harlequin, Harmonia axyridis, was first spotted (no pun intended) in Britain in 2004 and has gradually spread north and west. Here’s an identification guide. Can you see the teensy grey insect nearby? These were all over the metal frame of the bus stop, blending in well. Wonder what they are? 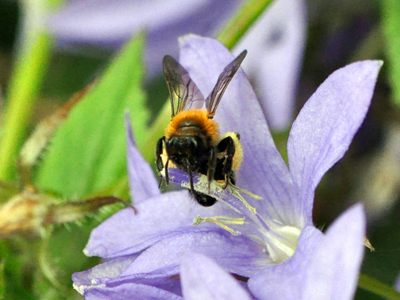 On a sunny day in summer my Campanula is always full of bees. If you know a little Latin, you will see Campanula translates as bellflower, but the variety I have, Campanula poscharskyana or Serbian bellflower, has open, star-shaped flowers rather than bells. 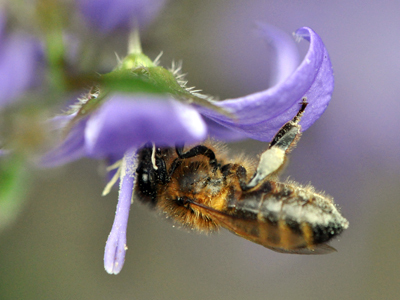 If I am not mistaken, bees like open flowers, as they have only a short proboscis (sort of hollow tongue) compared, say, with the long, wound-up proboscis of a butterfly that can reach into long, tubular flowers. 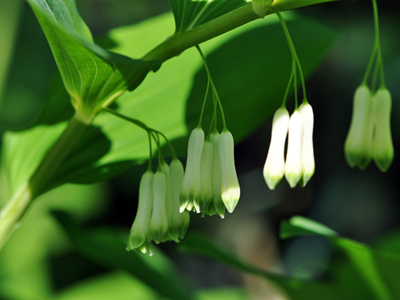 Many years ago we planted Solomon’s seal (Polygonatum multiflorum) in the civilised part of our shady garden, but within a few years it was in a mess. Every summer all the leaves would be eaten to shreds by the larvae of the Solomon’s seal sawfly (Phymatocera aterrima). To me they looked like the caterpillars of a butterfly. Now all those cultivated plants have disappeared but many have re-established themselves in the deep shade on a bank under trees – it is after all a native variety. 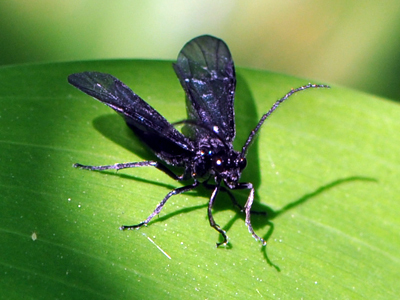 I saw one such this morning and spotted beautiful blue-black flies on them, moving around quite quickly over and under the leaves. I guessed they must be the sawflies, although I had never recognised them in adult form before.